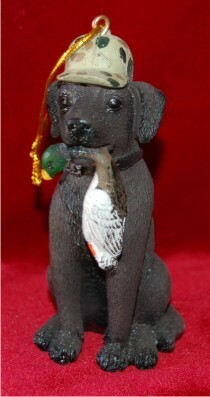 New Winter 2018: Keep wonderful memories of bird hunting with a cherished companion alive forever with this hunting dog ornament personalized to be unique. The chocolate Labrador with mallard in mouth personalized ornament is as cute as it is lifelike, perfect for the tree or the hunting lodge. One of our popular hunting ornaments personalized as gifts, the custom lettering is done by hand in a handsome font. Celebrate your hunting dog or delight a friend with the chocolate lab personalized hunting ornament that will be an instant favorite.